Computer Science Class of 60s talk this afternoon at 2:30 by Richard Stallman. TCL 123 (Wege). Exam update: I have decided to cut off the material to be covered at the memory organization topics we finished up last time. Microarchitecture will not be covered on this exam (there's always the final). As defined in a previous version of the Tanenbaum text - see handout. A scratchpad or register file. Each register may be independently loaded onto two buses (A and B) and loaded from a third (C). At most one register is attached to each bus at a time. Each register has control lines that govern the targeted output buses, and a strobe line that allows latching from the input bus. The strobe line on some register is high when the enable C line is high (ENC). The ALU supports (in Tanenbaum) four operations: A+B, A AND B, NOT(A), and A. The shifter supports three operations: logical shift left or right by one bit, or do nothing. Both require two control lines; the ALU delivers N and Z bits that describe the state of the current value computed by the ALU. Both units are combinational. Two buses (A and B) that deliver data from the scratchpad to the ALU, and a bus C that delivers data from the shifter to the scratchpad. In many respects, the performance and general success of the architecture hinges on the design of its datapath. The size of this data path from scratchpad through the ALU/shifter back to the scratchpad has to be short enough that information can make it all the way around in a "cycle"
It also contains a minimalist memory interface. Memory is adjacent to the CPU through the use of an address bus and a data bus. 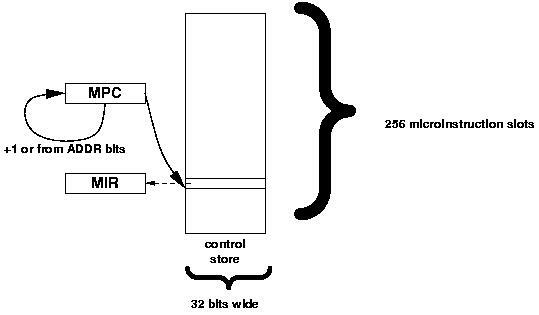 The outward, unidirectional address bus is driven by the memory address register (MAR). The bidirectional data bus is read or written by the memory buffer register (MBR). Reading and writing are governed by two lines: RD and WR. It is possible that neither are high. 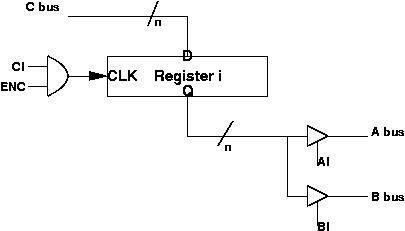 The MAR is a simple register, optionally loaded from the latch that captures the B bus. The MBR is a dual-ported register that may be loaded (MBR high) from the data bus (on RD), or from the C bus (on WR). Its value is always available at the ALU as an alternative to the A bus; the signal AMUX controls this alternative. Memory is much slower than the data path, but we will assume it's only half the speed (takes two data path cycles for a memory request to complete). In real life, there is a much larger discrepency. Recall: Design of a generic register. Design of the scratchpad register. Design of the dual-ported register. Design of a bit-slice of the ALU. Recall: A full-featured version of the shifter. See Fig. 3-16 of Tanenbaum 2006. A (horizontal) microinstruction is simply the collection of all the control lines necessary to determine the path of data in a cycle about the datapath. The collection of potentially useful microinstructions--the microprogram--is stored in a small, addressable memory, the control store. In Tanenbaum, there are 256 microcode instructions. A microprogram counter or MPC is an 8-bit value that selects the current microinstruction to be executed. The next microinstruction appears next in the control store. An incrementor computes the next MPC, keeping only 8 bits (ie. mod 256). Conditional branching (and loops, etc.) are made possible by extending each microinstruction with an alternative microinstruction address (8 bits), and two bits that select the alternative instruction when certain ALU conditions are met. The microsequencer determines the interpretation of these bits. The total is, then, 22+8+2=32 bits per microinstruction. There is nothing special about the number 32 in this case; microcode could have, say, 31 bits or 47 bits. Notice that the elimination of a single bit from the microinstruction would allow the addition of 8 more instructions in the same space. The microprogram counter (MPC) is an address to the control store (0..255). The microinstruction is the set of bits selected by the MPC and is strobed into the microinstruction register (MIR) for execution. The MPC is automatically incremented and made available as a possible next instruction. An alternative is the ADDR bits (0..255) of the MIR. The particular next MPC is selected by adjusting the MUX, controlled by the microsequencing logic. 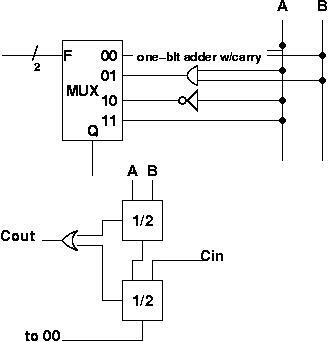 This logic simply takes the ALU status bits (N and Z) along with the 2 COND bits of the MIR to determine the appropriate setting of the MUX. Quick work with a Karnaugh map identifies the appropriate logic as C1Z+C1C0+C0N, where COND has bits C1C0. We need to coordinate the flow of information through the datapath. Tanenbaum uses a 4-cycle clock. See Figure 4-5 in Tanenbaum 1990.
subcycle 1: Load MIR, let signals settle. subcycle 2: Latch A and B buses, let signals settle. (Note AMUX was set on load of MIR). subcycle 3: Load MAR and let ALU, status bits, shifter and C bus settle. subcycle 4: Load MBR and scratchpad (if ENC) from C bus. The entire MIC1 microarchitecture is represented by the diagram in Tanenbaum 1990's Figure 4-10.